A tractor is a vehicle designed to provide a high tractive effort (pulling force) at slow speeds, in order to haul a trailer or machinery used in agriculture or construction. The term tractor is derived from the Latin trahere, which means "to pull." Most commonly, the word "tractor" is used to describe the distinctive farm vehicle. The farm tractor is used for pulling or pushing agricultural machinery or trailers, for plowing, tilling, disking, harrowing, planting, and similar tasks. In Canada and the United States, the word is also used to refer to a road tractor. Other common uses of the term include the lawn tractor and the power unit of a semi-trailer truck. The first powered farm implements in the early 1800s were portable engines—steam engines on wheels that could be used to drive mechanical farm machinery by way of a flexible belt. Around 1850, the first traction engines were developed from them and were widely adopted for agricultural use. Where soil conditions permitted, as in the U.S., steam tractors were used to direct-haul plows, but in the UK, plowing engines were used for cable-hauled plowing instead. Steam-powered agricultural engines remained in use well into the twentieth century, until reliable internal combustion engines were developed. In Britain, the first recorded tractor sale was the oil-burning Hornsby-Ackroyd Patent Safety Oil Traction engine, in 1897. However, the first commercially successful design was Dan Albone's three-wheel Ivel tractor of 1902. In 1908, Saundersons of Bedford introduced a four-wheel design, and went on to become the largest tractor manufacturer outside the U.S. While unpopular at first, these gasoline-powered machines began to catch on in the 1910s, when they became smaller and more affordable. Henry Ford introduced the Fordson, the first mass-produced tractor, in 1917. Built in the U.S., Ireland, England, and Russia, Fordson had 77 percent of the U.S. market by 1923. The Fordson dispensed with a frame, using the strength of the engine block to hold the machine together. By the 1920s, tractors with a gasoline-powered internal combustion engine had become the norm. The classic farm tractor is a simple open vehicle, with two very large driving wheels on an axle below and slightly behind a single seat. The seat and steering wheel consequently are in the center of the vehicle. The engine is placed in front of the driver, with two steerable wheels below the engine compartment. This basic design remained unchanged for a number of years, but all modern models are fitted with enclosed cabs, for reasons of operator safety and comfort. Originally, plows and other equipment were connected via a draw-bar, or a proprietary connecting system; prior to Harry Ferguson patenting the three-point hitch. Recently, Bobcat's patent on its front loader connection expired, and compact tractors are now being outfitted with quick-connect attachments for their front-end loaders. Modern farm tractors usually have five foot-pedals for the operator on the floor of the tractor. The pedal on the left is the clutch. The operator presses on this pedal to disengage the transmission for either shifting gears or stopping the tractor. Two of the pedals on the right are the brakes. The left brake pedal stops the left rear wheel and the right brake pedal does the same with the right side. This independent left and right wheel braking augments the steering of the tractor when only the two rear wheels are driven. This is usually done when it is necessary to make a tight turn. The split brake pedal is also used in mud or soft dirt to control a tire that spins due to loss of traction. The operator presses both pedals together to stop the tractor. For tractors with additional front-wheel drive, this operation often engages the 4-wheel locking differential to help stop the tractor when traveling at road speeds. A fifth pedal just in front of the seat operates the rear differential lock (diff lock) which prevents wheelslip. The differential allows the outside wheel to travel faster than the inside one during a turn. However, in traction conditions on a soft surface the same mechanism could allow one wheel to slip, thus preventing traction to the other wheel. The diff lock overrides this, causing both wheels to supply equal traction. Care must be taken to unlock the differential, usually by hitting the pedal a second time, before turning, since the tractor cannot perform a turn with the diff lock engaged. The pedal furthest to the right is the foot throttle. Unlike the setup in automobiles, it can also be controlled from a hand-operated lever ("hand throttle"). This helps provide a constant speed during field work. It also helps provide continuous power for stationary tractors that are operating an implement by shaft or belt. The foot throttle gives the operator more automobile-like control over the speed of the tractor for road work. This is a feature of more recent tractors; older tractors often did not have this feature. In the UK, it is mandatory to use the foot pedal to control engine speed while traveling on the road. Some tractors, especially those designed for row-crop work, have a "de-accelerator" pedal, which operates in the reverse fashion to an automobile throttle, in that the pedal is pushed down to slow the engine. This is to allow fine control over the speed of the tractor when maneuvering at the end of crop rows in fields—the operating speed of the engine is set using the hand throttle, and if the operator wishes to slow the tractor to turn, he simply has to press the pedal, turn, and release it once the turn is completed, rather than having to alter the setting of the hand throttle twice during the maneuver. Modern farm tractors employ large diesel engines, which range in power output from 18 to 575 horsepower (15 to 480 kW). Tractors can be generally classified as two-wheel drive, two-wheel drive with front wheel assist, four-wheel drive (often with articulated steering), or track tractors (with either two or four powered rubber tracks). Variations of the classic style include the diminutive lawn tractors and their more capable and ruggedly constructed cousins, garden tractors, that range from about 10 to 25 horsepower (7.5-18.6 kW) and are used for smaller farm tasks and mowing grass and landscaping. Their size—especially with modern tractors—and the slower speeds are reasons motorists are urged to use caution when encountering a tractor on the road. A PTO shaft plugged into a tractor. Most tractors have a means to transfer power to another machine, such as a baler, slasher, or mower. Early tractors used belts wrapped around a flywheel to power stationary equipment. 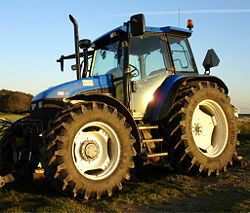 Modern tractors use a power take-off (PTO) shaft to provide rotary power to machinery that may be stationary or pulled. Almost all modern tractors can also provide external hydraulic fluid and electrical power. Most farm tractors use a manual transmission. They have several sets of gear ratios divided into speeds. In order to change the ratio, it is usually necessary to stop the tractor. Between them they provide a range of speeds from less than one mile per hour suitable for working the land, up to about 25 miles per hour (40 km/h) for road use. Furthermore, it is usually not necessary to change gear in order to reverse, one simply selects a lever. 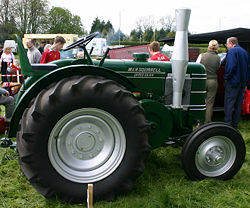 Older tractors usually require that the operator depress the clutch in order to shift between gears (a limitation of straight-cut gears in the gearbox), but many modern tractors have eliminated this requirement with the introduction of technologies such as power shifting in the 1960s, and more modern continuously variable transmissions. This allows the operator more and easier control over working speed than the throttle alone could provide. Slow, controllable speeds are necessary for most operations that are performed with a tractor. They help give the farmer a larger degree of control in certain situations, such as field work. However, when traveling on public roads, the slow operating speeds can cause problems, such as long lines or tailbacks, which can delay or aggravate other road users. To alleviate conditions, some countries (for example, the Netherlands) employ a road sign on some roads that means "no farm tractors." Some modern tractors, such as the JCB Fastrac, are now capable of the much more tolerable road speeds of around 50 mph (80 km/h). Agriculture in the United States is one of the most hazardous industries, surpassed only by mining and construction. No other farm machine is so identified with the hazards of production agriculture as the tractor. Tractor-related injuries account for approximately 32 percent of the fatal and 6 percent of the non-fatal injuries in agriculture. Over 50 percent of these are attributed to tractor overturns. The modern tractor has a roll over protection structure (ROPS) to prevent an operator from being crushed if the tractor overturns. The ROPS and seat belt, when worn, are the two most important safety devices to protect operators from death during tractor overturns. It is important to remember that the ROPS does not prevent tractor overturns. Rather, it prevents the operator from being crushed during an overturn. This is especially important in open-air tractors, where the ROPS is a steel beam that extends above the operator's seat. For tractors with operator cabs, the ROPS is part of the cab's frame. An ROPS with an enclosed cab further reduces the likelihood of serious injury because the operator is protected by the cab's sides and windows. 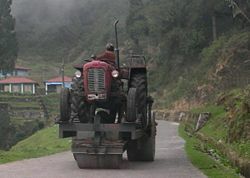 Before tractors were required to have ROPS (before the 1960s), some farmers died when their tractors rolled over them. Row-crop tractors, before ROPS, were particularly dangerous because of their "tricycle" design with the two front wheels spaced close together and angled inward toward the ground. Some farmers were killed by rollovers while operating tractors along steep slopes. Others were killed while attempting to tow or pull an excessive load from above axle height, or when cold weather caused the tires to freeze down, in both cases causing the tractor to pivot around the rear axle. For the ROPS to work as designed, the operator must stay within the protective frame of the ROPS. This means the operator must wear the seat belt. Not wearing the seat belt may defeat the primary purpose of the ROPS. An unusual application: a road roller powered by a tractor-drive. Farm implements can be attached to the rear of a tractor by either a drawbar or three-point hitch. The latter, invented by Harry Ferguson, has been standard since the 1960s. Equipment attached to the three-point hitch can be raised or lowered hydraulically with a control lever. The equipment attached to the three-point hitch is usually completely supported by the tractor. Another way to attach an implement is via a Quick Hitch, which is attached to the three-point hitch. This enables a single person to attach an implement quicker, and it puts the person in less danger when attaching the implement. 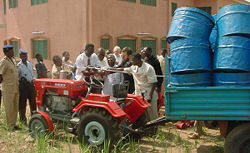 Some farm-type tractors are found in places other than farms: In the gardening departments of large universities, in public parks, and at highway construction sites, where the tractor may have blowtorch cylinders strapped to its sides and a pneumatic drill air compressor permanently fastened over its power take-off. These are often fitted with grass (turf) tires, which are less damaging on soft surfaces than agricultural tires. Space technology has found its way down to agriculture in the form of GPS devices and robust, on board computers installed as optional features on farm tractors. These technologies are used in modern, precision farming techniques. The spin-offs from the space race have actually facilitated automation in plowing and the use of autosteer system drones on tractors that are manned but steered only at the end of a row. The idea is to avoid overlap, use less fuel, and not leave streaks when performing jobs such as cultivating. Kubota and New Holland Compact Tractors equipped with front-end loaders. In the middle is a 24 hp (18 kW) diesel CUT illustrating the size difference between a small farm tractor and a garden tractor. A Compact Utility Tractor (or CUT) is a smaller version of an agricultural tractor, designed primarily for landscaping and estate management type tasks rather than for planting and harvesting on a commercial scale. Typical CUTs range from 20 to 50 horsepower (15-37 kW) with available power take off (PTO) horsepower ranging from 15 to 45 hp (11-34 kW). CUTs (especially those below 40 horsepower (30 kW)) are often equipped with both a mid-mounted PTO and a standard rear PTO. The mid-mounted PTO shaft typically rotates at/near 2000 rpm and is typically used to power such implements as mid-mount finish mower, a front-mounted snow blower, or front-mounted rotary broom. The rear PTO is standardized at 540 rpm for the North American markets, but in some parts of the world a dual 540/1000 rpm PTO is standard, and implements are available for either standard in those markets. Howse brand modular Subsoiler attached to a tractor. Broadcast seeder mounted to a Kubota Compact Utility Tractor. One of the most common attachments for a compact utility tractor is the front end loader or FEL. Like the larger agricultural tractors, a CUT has an adjustable three-point hitch with hydraulic controls. Typically, a CUT has a four-wheel drive (more correctly, a four-wheel assist). Modern Compact Utility Tractors often feature a Hydrostatic transmission, but many variants of gear drive transmissions are also available, from low-priced, simple gear transmissions to synchronized transmissions to advanced, glide-shift transmissions. All modern CUTs feature a government mandated roll over protection structure (ROPS) just like agricultural tractors. Although less common, compact backhoes may be attached to compact utility tractors. JD 71 Flexi Planter for tractors 20 to 35 horsepower. Compact utility tractors require special smaller implements than full-sized agricultural tractors. Common implements include the box blade, grader blade, landscape rake, post hole digger (or post hole auger), rotary cutter (also called a slasher or a brush hog), a mid- or rear-mount finish mower, broadcast seeder, subsoiler, and rototiller (or rotary tiller). In colder climates, a rear-mounted snow blower is very common. There are many more implement brands than there are tractor brands offering CUT owners a wide selection to choose from. For small-scale farming or large-scale gardening, there are some plating and harvesting implements sized for CUTs. One and two row planting units are commonly available, as are cultivators, sprayers, and different types of seeders (slit, rotary, and drop). 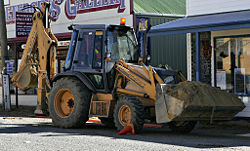 A common backhoe loader. The backhoe is on the left, the bucket/blade is on the right. The most common variation of the classic farm tractor is the hoe, also called a hoe loader or backhoe loader. As the name implies, it has a loader assembly in the front and a backhoe in the back. Backhoes attach to a 3-point hitch on farm or industrial tractors. Industrial tractors are often heavier in construction, particularly with regards to the use of a steel grill for protection from rocks and the use of construction tires. When the backhoe is permanently attached, the machine usually has a seat that can swivel to the rear to face the hoe controls. Removable backhoe attachments almost always have a separate seat on the attachment. Backhoe loaders are very common and can be used for a wide variety of tasks: Construction, small demolitions, light transportation of building materials, powering building equipment, digging holes, loading trucks, breaking asphalt, and paving roads. Some buckets have a retractable bottom, enabling them to empty their load more quickly and efficiently. Buckets with retractable bottoms are also often used for grading and scratching off sand. The front assembly may be a removable attachment or permanently mounted. Often the bucket can be replaced with other devices or tools. Their relatively small frame and precise control make backhoe loaders very useful and common in urban engineering projects such as construction and repairs in areas too small for larger equipment. Their versatility and compact size make them one of the most popular urban construction vehicles. 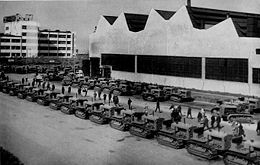 A tractor factory in Chelyabinsk in the Soviet Union, c. 1930. The durability and engine power of tractors made them highly suitable for engineering tasks. Tractors can be fitted with engineering tools such as a dozer blade, bucket, hoe, or ripper. When fitted with engineering tools, the tractor is called an engineering vehicle. A bulldozer is a track-type tractor attached with a blade in the front and a rope-winch behind. Bulldozers are very powerful tractors and have excellent ground-hold, as they are built to push or drag things along the ground. Bulldozers have been further modified over time to produce new machines that are capable of working in ways that the original bulldozer could not. One example is the manufacture of loader tractors, in which the blade was replaced by a large-volume bucket and hydraulic-powered arms that can raise and lower the bucket, thus making it useful for scooping up earth, rock, and similar loose material to load it into trucks. Alternatively, the bulldozer may be fitted with a pallet fork or a bale grappler. Other modifications to the original bulldozer include making the machine smaller, so that it can operate in small work areas where movements are limited. There are also tiny-wheeled loaders, officially called Skid-steer loaders but nicknamed "Bobcat" after the original manufacturer, which are particularly suited for small excavation projects in confined areas. Garden tractors (also called mini tractors) are small, light, and simple tractors designed for use in domestic gardens. They are usually designed for cutting grass, being fitted with horizontal rotary cutting decks. The distinction between a garden tractor and a ride-on lawnmower is often hard to make. Generally, a garden tractor has a more sturdy build, with stronger frames, axles, and transmissions. Garden tractors are generally capable of mounting other implements such as harrows, cultivators/rotavators, sweepers, rollers and dozer-blades. Like ride-on mowers, garden tractors generally have a horizontally mounted engine with a belt-drive to a transaxle-type transmission (usually of 4- or 5-speeds, although some may also have two-speed reduction gearboxes or hydraulic gearboxes). The engine is generally a 1- or 2-cylinder gasoline (petrol) engine, although diesel engine models are also available, especially in Europe. In the U.S., the term riding lawn mower today refers to mid- or rear-engined machines. Front-engined tractor layout machines designed primarily for cutting grass and light towing are called lawn tractors, and heavy-duty lawn tractors, often shaft driven, are garden tractors. The primary difference between a lawn tractor and a garden tractor are the frame weight, the rear wheels (garden tractors almost always have multiple mounting bolts, while most lawn tractors have a single bolt or clip on the hub), and the ability to use ground engaging equipment such as plows or disk-harrows. A Ford that was rebuilt to produce an EPA tractor. A Volvo Duett that was rebuilt to produce an EPA tractor. The intended use is no longer as a farm vehicle. An "A tractor" based on Volvo 760. Notice the "slow-vehicle" triangle and longer boot. 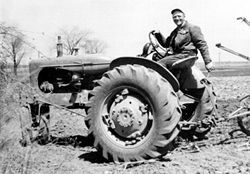 During World War II, a shortage of tractors in Sweden led to the invention of a new type of tractor called the EPA tractor. (EPA was a chain of discount stores and the name was often used to signify something of lower quality.) An EPA tractor was simply an automobile, truck, or lorry, with the passenger space cut off behind the front seats, equipped with two gearboxes in a row. When an older car with a ladder frame was modified in this manner, the result was not dissimilar to a tractor and could be used as one. After the war, it remained popular, not as a farm vehicle but as a way for young people without a driver's license to own something similar to a car. Since it was legally considered a tractor, it could be driven by people from 16 years of age and only required a tractor license. Eventually, the legal loophole was closed and no new EPA tractors were allowed to be made, but the remaining ones were still legal—leading to inflated prices and protests from people who preferred EPA tractors to ordinary cars. On March 31, 1975, a similar type of vehicle was introduced, the A tractor, from arbetstraktor (work tractor). The main difference is that an A tractor has a top speed of 30 km/h. This is usually done by fitting two gearboxes in a row and not using one of them. For a long time, the Volvo Duett was the primary choice for conversion to an EPA or A tractor, but since supplies have dried up, other cars have been used. Road tractors, tractor units, or traction heads. Heavy-duty vehicles with large engines and several axles. The majority of these tractors are designed to pull long semi-trailers, most often for the transport of freight of some kind over a significant distance (as in semi-trailer truck). In England this type of "tractor" is often called an "artic cab" and is connected to the trailer with a fifth wheel coupling. A minority is the ballast tractor, whose load is hauled from a drawbar. Vehicles used to tow artillery pieces of varying weights. In aircraft, a tractor configuration refers to the propellers being in front of the fuselage or wing. Conversely, if to the rear, it is a called a pusher configuration. NASA and other space agencies use very large tractors to ferry launch vehicles, such as booster rockets and space shuttles, from their hangars to (and, in rare cases, from) the launchpad. A tractor is also the part of a computer printer that pulls paper into the device or pushes it along. This usually takes the form of a pair of toothed gears that mesh with holes punched near the edges of the paper, or a belt or wheel with rubber or other high-friction surface that makes contact with the paper. A tractor is a device which is used for conveying advanced instruments into well holes for measurement and data logging purposes. The device is driven through cased or open well holes by wheels, chains, or tractor belts, and usually consists of a shell housing, an engine (electric or fluid-driven), a driving mechanism/transmission, measuring equipment, and interface with the surface. ↑ Houghton Mifflin, The American Heritage Dictionary of the English Language. Retrieved May 16, 2008. ↑ Living History Farm, Tractors in the 1930s. Retrieved May 16, 2008. ↑ www.cdc.gov, Work Safety. Retrieved May 16, 2008. ↑ K. Donham, D. Osterberg, M.L Meyers, and C. Lehtola, Final report tractor risk abatement and control: The policy conference, September 10-12, 1997 (Iowa City: The University of Iowa). ↑ Colorado State University, Farming. Retrieved May 16, 2008. ↑ Wheel Horse (now part of Toro) garden tractors have vertically mounted engines with a belt-drive. Ertel, Patrick W. 2001. The American Tractor: A Century of Legendary Machines. Osceola, WI: MBI Pub. Co. ISBN 0760308632. Glastonbury, Jim. 2003. The Ultimate Guide to Tractors. Edison, NJ: Chartwell Books. ISBN 0785816879. Pripps, Robert N. 2001. The Big Book of Farm Tractors: The Complete History of the Tractor 1855 to Present, Plus Brochures, Collectibles, and Lore. Vancouver: Raincoast Books. ISBN 0896584712. Sanders, Ralph W., and Bob Feller. 2007. The Farm Tractor: 100 Years of North American Tractors. St. Paul, MN: MBI Pub. Co. and Voyageur Press. ISBN 9780760330746. Case Report: 04NY077 Farm Owner Dies during Tractor Overturn. This page was last modified on 14 December 2015, at 20:23.